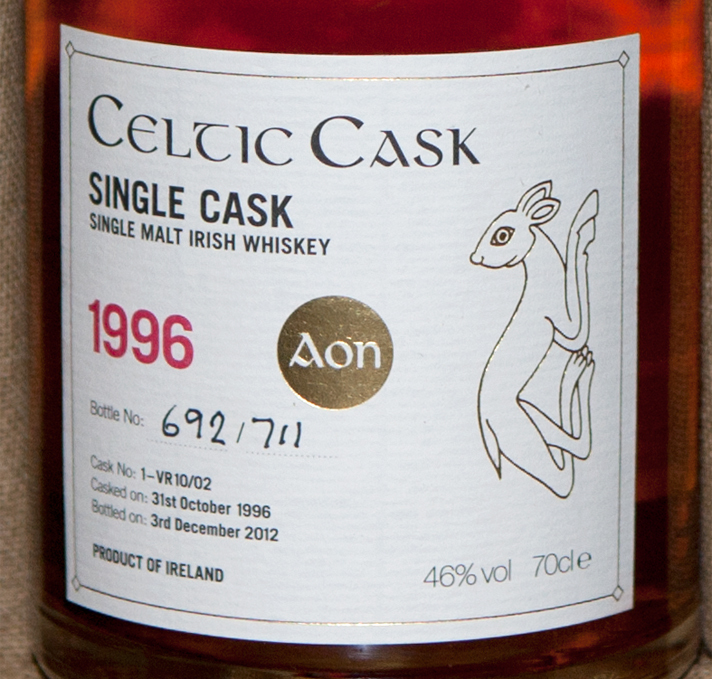 Celtic Cask Aon (which means "one" in Irish) is the first of the Celtic Whiskey Shop's bottlings of whiskey under its own label. 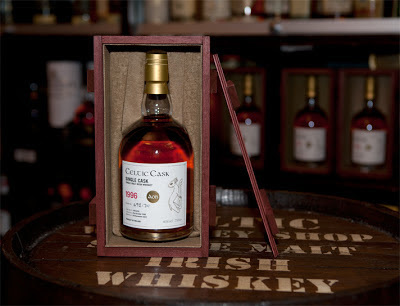 The malt whiskey was initially aged for three years in second fill bourbon casks and then moved to fresh bourbon casks for the next 11 years. (The distillery might intervene like this if the first cask isn't working enough magic on the spirit.) In July 2010, three of these casks were emptied to fill an 80 year-old Palo Cortado Sherry cask from Bodegas Emilio Hidalgo. This sherry cask was made from American oak. Bodegas Emilio Hidalgo is a small family winery founded in 1874 and located in the heart of Jerez de la Frontera. Palo Cortado is a rare variety of sherry that is initially aged under flor (a film of yeast) to become a fino or amontillado, but inexplicably loses this veil of flor and begins ageing oxidatively as an oloroso. The result is a wine with some of the richness of oloroso and some of the crispness of amontillado. Only 1-2% of the grapes pressed for sherry develop into Palo Cortado. Pale bronze in colour with a slight reddish hue. Sweet exotic fruits, roasted nuts, sultanas, baked apples, toasty oak and a touch of demerara sugar. Incredible mouth-feel with a thick, viscous texture. Flavours of warm spices, toffee, creme caramel, baked fruits, sultanas, dates, chocolate brownies and walnuts. 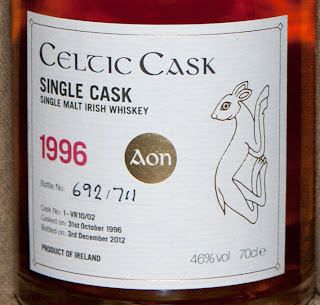 Very smooth with more of the toffee and chocolate notes persisting towards the end.